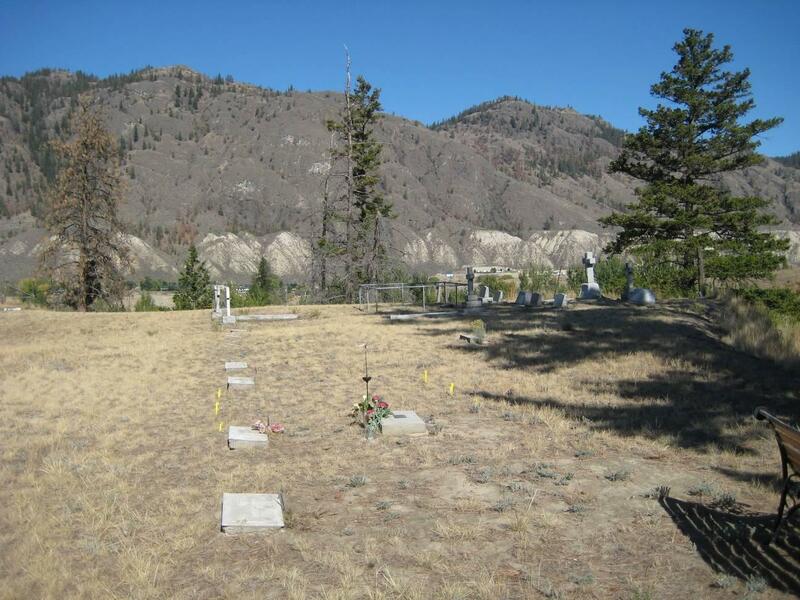 The following is a transcription of the St. Peter's Church Cemeterylocated in Monte Creek British Columbia, Canada. Latitude: 50o 38' 46.24" N.
Longitude: 119o 57' 29.21" W.
The area of Monte Creek was originally known as "Ducks", named for Jacob Duck, an Englishman, who came to Canada in the 1860's Jacob Duck was postmaster of the Duck and Pringle Post Office that opened in the early 1870's. He remained in this position until May 1888. On October 1, 1896 the name of the Post Office was changed to "Monte Creek". Church services in the district began in the late 1880's. In 1907, the first Vestry Meeting was held at Duck's. St. Peter's Church was erected in memory of Alexander Hewitt Bostock, son of Senator Hewitt and Lizzie Bostock. Alexander Bostock died at age 23 in 1916 in WWI. The first service in the church was held on Christmas Day 1926. The church was consecrated, in the name of St. Peter, by Bishop Doull on July 31, 1927. The St. Peter's Church Cemetery was first established in the early 1900'. 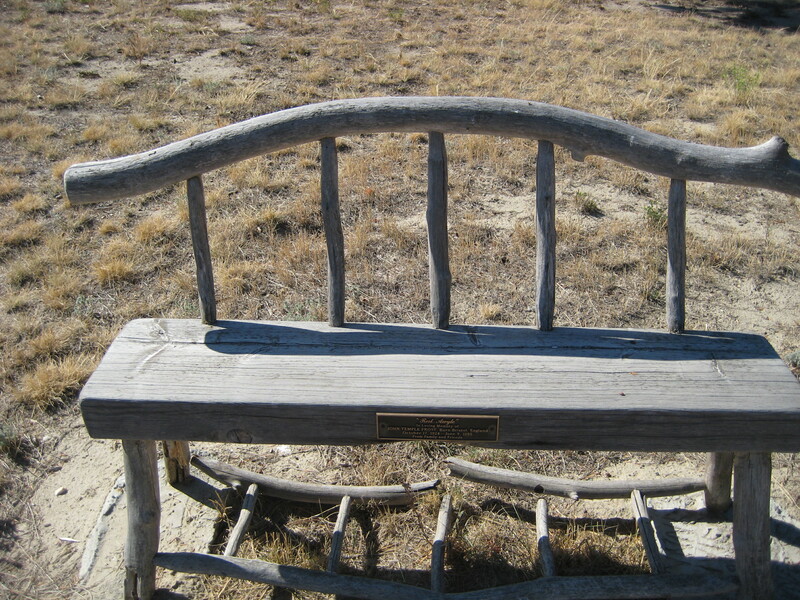 The first marked grave dates to 1906. The site was consecrated by the Bishop of Kootenay on Sunday, July 31 at 5:00 pm. The cemetery land was also a donation from the Senator and his wife. 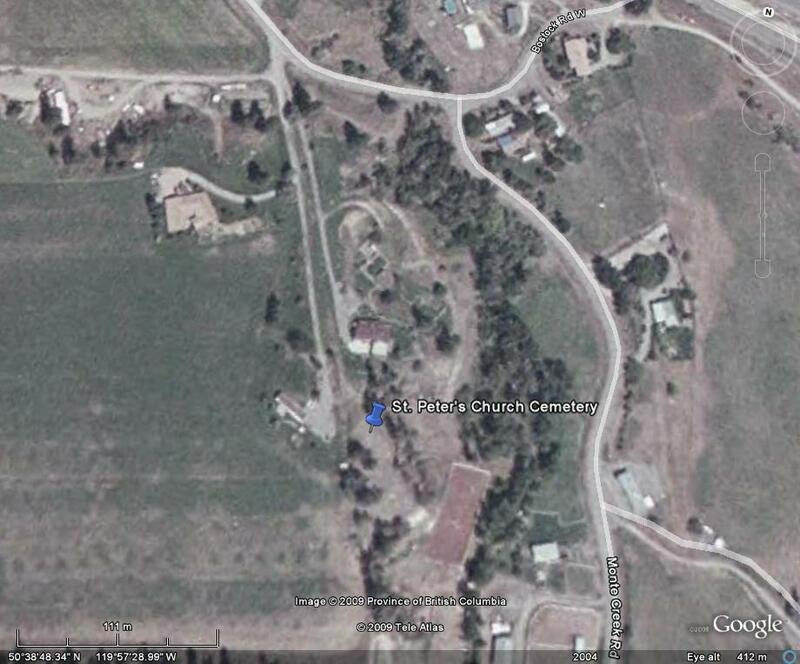 The cemetery is approximately an acre in size and well maintained by the residents who live next to the cemetery. It is enclosed by a wire fence on all sides with a metal gate enclosing the area. The graves are laid out east/west. The majority of the monuments are made of concrete, stone, marble and granite. There is a mix of old, upright markers and flat markers. 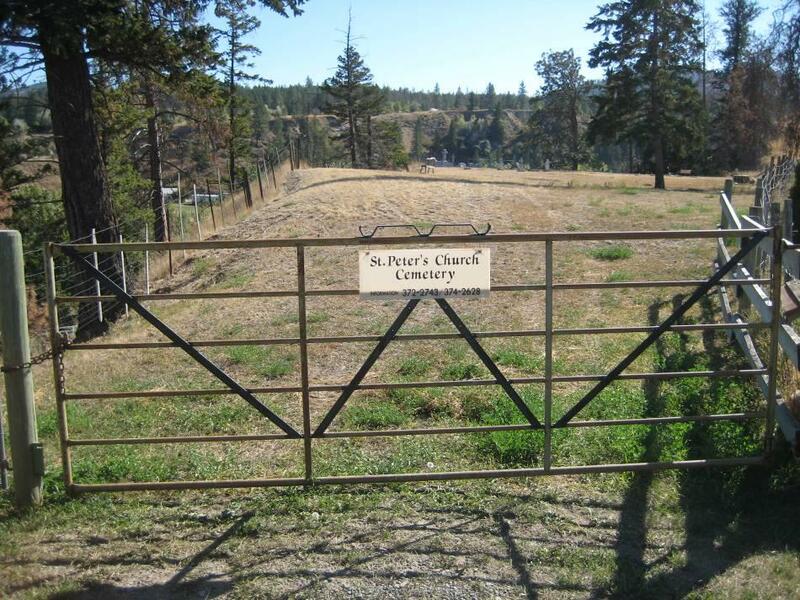 Although a part of St. Peter's Church the actual cemetery is not located beside the church which is situated just north of Trans-Canada Way (Highway 1), on Bostock Road West. In order to reach the cemetery from the Trans-Canada Highway, take the Hook Road exit and proceed south on it until the intersection with Dallas Road. Turn east onto Dallas Road and proceed approximately 1.6 km until the intersection with Monte Creek Road. Turn right onto Monte Creek Road and proceed approximately 300 meters until 1457 Monte Creek Road. Turn onto this driveway and travel up the hill 200 meters when the gate to the cemetery can be seen.